We, electric power suppliers, are now endeavoring to expand the introduction of renewable energy in the form of electric power of secured quality. The representative renewable energy, solar power generation, is a fluctuating-type power source that depends on weather conditions. For this reason, the precise prediction of power output of solar power plants is critical to the effective use of solar power generation as a power supply source. We have developed and introduced unique methods to predict power output of solar power plants based on weather data, and utilized them in our actual works. However, the prediction accuracy can be degraded by local weather changes, recent climatic changes, or impacts due to snow/accumulated snow on solar panels during the winter season. Further efforts are required to improve the prediction accuracy under these conditions. 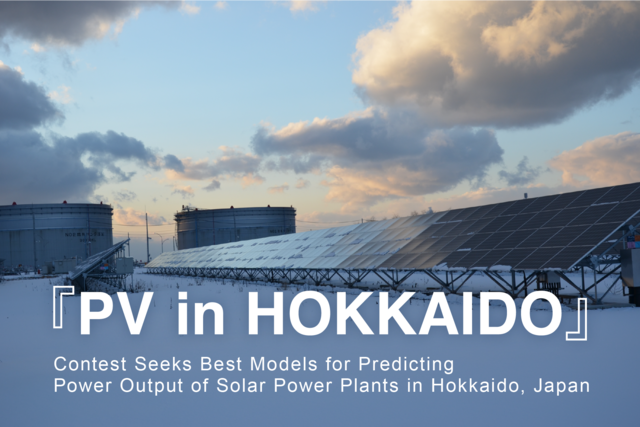 Tokyo Electric Power Company Holdings (TEPCO) and Hokkaido Electric Power Company (HEPCO) have therefore decided to jointly host a "PV in HOKKAIDO - Contest Seeks Best Models for Predicting Power Output of Solar Power Plants in Hokkaido, Japan". The aim of the contest is to discover innovative methods and new approaches to solar power generation prediction by inviting contest Participants to submit technologies to predict power output of solar power plants in the Hokkaido area. Contest Participants will be asked to predict the sum of power output from a set of specified solar power plants connected to power systems in the Hokkaido area. We, the Contest Hosts, will determine the winners by comprehensively considering the proposed prediction models, their practicality and expandability, and the accuracy of the predicted results. We intend to apply the most excellent of the proposed methods from the contest in our actual operations with the aim of expanding the introduction of solar power generation and improving the stability of power supply by predicting power output of solar power plants more accurately. Prediction of the total power output from specified solar power plants in the Hokkaido area. * The Judging Committee decides the Grand Prize, Runner-up, award for the method, and special award, based on a review. * The award for accuracy is decided based on prediction errors during the entire period (RMSE). Utilizing the data provided by the Contest Hosts in advance or external data collected by each Participant, Participants are required to predict the sum of power output from solar power plants during the target period. Participants are to propose method to predict power output of solar power plants of the following day (DAY:d) using his/her own selected data sets which can be obtained by 6:00 pm on the day before the targeted prediction day(DAY:d-1) . 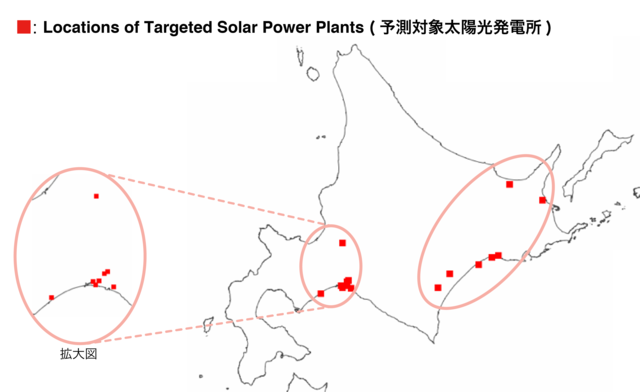 The prediction targets specified by the Contest Hosts are 15 solar power plants connected to power systems in the Hokkaido area (407.3 MW capacity in total). The targeted solar power plants are selected on the basis of the relatively large scale of their operations and the periods they are to operate within the prediction target period. Use the method proposed by the Participant to predict the sum of power output(MW)* of solar power plants during the target period (from 0:00 am, January 1, 2018 to 11:30 pm, January 31, 2019) for successive 30-minute periods. Submit the results in CSV file format specified by the Operations Secretariat. A sample CSV file will be sent to the Participant together with the information that can be used for prediction. * The method should predict the sum of power output(MW) of specified solar power plants. Please note that the prediction target is not power output of individual solar power plants. 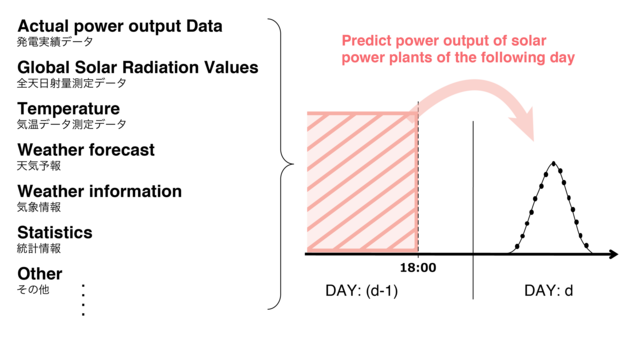 Write a summary of the proposed prediction method, the data type to be used for the prediction, and any information and details in support of specially designed points, etc. Write out the details of the proposed prediction method and discuss what can be found from comparison between the prediction results and the correct answer data separately provided. Create a video to describe the proposal and its advantages. The video is to be within 5 minutes. Please note that, because the review time is limited, the Contest Hosts will not review any portion of a presentation video running beyond 5 minutes. The Operations Secretariat will separately give the eligible Participants instructions on how to format and submit the various items to be submitted. The prediction accuracy and practicality/expandability of the prediction methods are comprehensively determined. If a prediction can be performed using as little less data as possible, the method will be favorably assessed for practicality. Following are the dates scheduled for the Contest. Prize Winners for each of the following prizes are chosen from among the Participants Selected for the Final Review* and prize money is awarded. * If none of the predictions meet certain criteria, the result for award may be "No Prize Winner." The results of the Final Selection will be published on the Contest Website and the websites of the Contest Hosts. The Contest Hosts will also notify to each Prize Winners separately and pay out the prize money. The qualifications/conditions for participation in the Contest are shown below. 1. No age limits (if a minor applies, approval of a legal representative is necessary). 2. Participation as a group is also possible. 3. If the same Participant uses different methods, multiple entries are acceptable. 4. Participants should be TEPCO CUUSOO account members (Participants must agree with all provisions TEPCO CUUSOO user policy). 5. Participants must agree with all of the provisions of the "Participation Rules." 6. Power industry personnel may participate in this contest. However, individuals working at any of the contest hosting companies maybe asked to refrain from participation. * A notification will be sent to the applicant within 7 business days of the submission of the pre-proposal. If the proposal is submitted from December 25, 2018 (Tue) to January 6, 2019 (Sun), the notification will be sent after January 7, 2019 (Mon). * If an entry has not been accepted, the applicant can resubmit the entry with modifications (please review and revise the contents of the pre-proposal). 5. The study data (complete version) are received (only by accepted Participants). In considering pre-proposal, please see the following data samples. (Google drive is used to share files. When you click the link, you will be directed to an external site. If you cannot access the page, please change your browser setting or contact Contest Secretariat. 1. Consider a prediction method and perform prediction works based on the training data set (complete version). 2. If prediction results on power output are submitted within the submission period, you can check your tentative ranking and prediction accuracy on the Contest Website. * You can submit the reviewed method as many times as you want before the submission deadline (the latest submission is used for evaluation. The preliminary ranking will be published only once). * Only prediction results submitted within the preliminary ranking limit are included. * The preliminary ranking is optional. This will not affect the First Selection. To inquire about the Contest, please email the Operations Secretariat. Depending on the content of your inquiry, the Contest Hosts may contact you directly to respond. Please understand in advance. Inquiries on the selection review will not be accepted. Responses to inquiries emailed from December 25, 2018 (Tue) to January 6, 2019 (Sun) will be sent after January 7, 2019 (Mon). ・ Tokyo Electric Power Company Holdings, Inc.
・ Hokkaido Electric Power Co., Inc.
●When submitting an application for entry, all applicants will be asked to accept Participation Rules on the Entry Form. ● Use of any furnished training data shall be limited to contest applications. The training data shall not be provided to non-applicants and its use is strictly prohibited for unauthorized activities. In addition, once the contest period ends, all furnished data shall be deleted or destroyed. ●Participants are asked to consult the Contest Secretariat in advance if they are considering using the method constructed for this contest or any results for a university graduation thesis, master’s thesis, doctoral dissertation or submission of a paper to an academic society or other such organization. Preparation of a manuscript without such permission is prohibited. Also, inclusion of any furnished data as-is in a manuscript is not allowed. Applicants and participants are asked to consent to these stipulations. ●Please note that the organizers, people that the organizers deem necessary for judging, people that the organizers deems necessary for considering, and the secretariat shall view and judge the submissions. There are the possibilities that submissions will be seen by members from Contest Hosts' group companies in order to consider the further utilization possibility on business. In such case, information will be handled properly. Q. Is the Prediction Target Term prediction of past period? A. Because the target term is from January 1, 2018 to January 31, 2019, and submissions start from February 1, 2019, the prediction must be of the past. Q. Why predict the past? A. Since the actual values of power output of solar power plants are not open to the public, participants are to predict power output of solar power plants using meteorological actual data etc. In this contest, we are seeking methods to accurately predict the pawer output from the given sources. Q. Is it possible to talk with Operations Secretariat on the phone? Q. 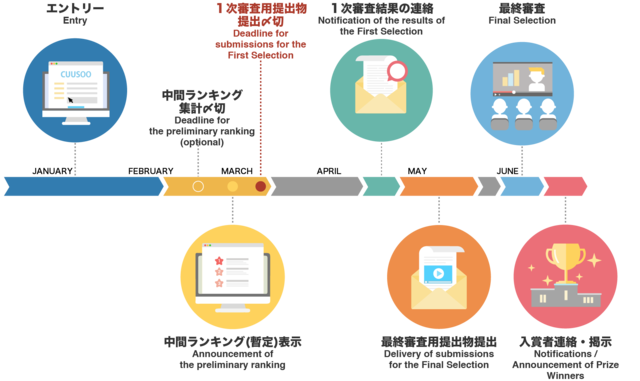 Is it possible to directly contact Operational Organization? Q. Is it possible to refuse prize payment? A. You can refuse your prize payment after winning. Inform the Operations Secretariat of your intention to decline the prize money when you are contacted as a prize winner candidate. Q. Can person who belongs to the organizers of Operational organization? A. Power industry personnel may participate in this contest. However, individuals working at any of the contest hosting companies maybe asked to refrain from participation. Please ask the Operations Secretariat. Q. Does the "Rating output" of solar power plants represent the output for panels, and not PCS? A. The rating output data is based on open data of Hokkaido Regional Environment Office site. In principle, all data used for this contest shall only be information that are open and publicly available. Since not all available sites make public of whether the Rating output is for output of panels or PCS, we are afraid that we are not at liberty to answer. Q. It is stated that "azimuth angle and panel-inclination angle" are average values of the solar panel installation area. Are these values simply derived by dividing sum of the solar panel’s azimuth/inclination angle by the number of solar power plants. Q. Does "Independently measured amount of global solar radiation" represent the horizontal solar radiation? A. No. Actual Data(ai) represents data for the whole target date.